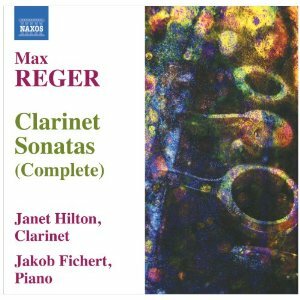 The Op.49 Clarinet Sonatas are among the most popular works in Reger's copious chamber music catalogue. They were conceived as a direct response to Brahms' Op.120 Sonatas, giving both performers and audience a convenient handle on their stylistic profile and musical construction. But Reger is not Brahms, and it is dangerously reductive to treat Reger's chamber music as a series of second-rate Brahms knockoffs. Janet Hilton and Jakob Fichert obviously feel the same, and have produced an album of Reger that couldn't be further from the model of the composer's mentor. That is quite brave, because playing Reger like Brahms can have the effect of glossing over some of the compositional, and more specifically structural, problems of his work. But the performances here revel in the moment and leave the structural concerns to more or less look after themselves. For the most part, the approach works very well. Even when his textures are at their most opaque, there is usually a linear thread of melody, or at least of voice leading, to guarantee the flow and coherence of the music. And there are many moments of repose, brief episodes of introduction, interlude or coda, where the music forgets all about its supposed structural function and the clarinet floats breezily above sustained piano chords. Hilton and Fichert are never tempted to ground these episodes, to rein them in for the sake of the overall structure or momentum. The most obvious direct comparison to make is with the recording by Florent Héau and Patrick Zygmanowski that appeared last year on ZigZag (read my review here). Their approach is much more Brahmsian, i.e. more structural, more goal orientated, and on the whole just plain faster. Reger was not one for metronome marks, presumable sharing Mahler's view that the amount of rubato required to bring music to life would make any tempo indication redundant after only a few bars. If that is the case, then Hilton and Fichert are much more in the spirit of the music than Héau and Zygmanozski, simply by virtue of the quantity of rubato in their readings. But both recordings have their merits, and I'd struggle to pick a favourite despite the differences in interpretation. The piano sounds a little more distant on this recording, which is both a blessing and a curse. Reger's accompaniment textures can often get very dense, so bringing the clarinet to the fore at least has the effect of reinforcing the fact it is only accompaniment, even if details get lost in the process. Janet Hilton puts in a distinctive performance, her range of hard articulations are a real benefit in the faster movements. Her tone at the bottom is wonderful, although she is sometimes a little insecure towards the top. It is very unusual to find a British soloist tackling Reger, and I'm almost inclined to say that there is an British dimension to her interpretation. By moving away from the thematic and structural rigour of Brahms, she brings Reger closer to his British contemporaries. I'm thinking particularly of Vaughan Williams, who would surely have been proud to have written some of these slow movements. The word 'Complete' in the title of this disc alludes to the fact that, along with the Op.49 Sonatas, the more rarely performed Op.107 Sonata is also included. It's omission from other recordings is understandable in that it is very long, even more structurally wayward, and has a life of its own in arrangements by the composer for both violin and viola. It's well worth a listen though, if you find Reger's piano textures indigestible, you should get on all right with the more open sounds here. And the adagio is a Reger classic, a long, unfurling melody over the sparsest of piano textures. This is where Hilton's approach really pays off, her reading is slow but always retains that vital sense of melodic line. The Op.107 Sonata pushes the running time up to almost 80 minutes, making the disc something of a technical feat on the part of Naxos, and as ever from the label, an absolute bargain.